Saturday, April 13 (continued): In their quietest and most private moments, those who dare to be great must ask themselves if they can really perform their best when the stakes are the highest, when the competition is the stiffest and when the moment is finally thrust upon them and they have no choice but compete or retreat. In public, they will answer yes to every scenario but, in reality, they won’t really know until the career-defining event begins. Claressa Shields and Christina Hammer answered the call tonight and, long before the final bell sounded, it was abundantly clear which athlete was going to be the victor and which athlete was going to be the vanquished. While facing the best and most decorated opponent of her career, Shields lifted her game to heights previously unseen and hammered Hammer as no previous opponent had. The result was a 98-92 and 98-91 twice sweep on the scorecards that raised Shields’ rank to that of undisputed middleweight champion while permanently exiling the Kazakh-born German from the ranks of the undefeated. In addition to her four alphabet titles, Shields became the first female owner of The Ring Magazine championship belt. Surely this was the moment Shields had been dreaming about since the second she dedicated herself to boxing and she couldn’t have asked for a better performance in achieving it. The wildness that marked her earlier fights was replaced by straighter punches, a jab that was often doubled and tripled and power punches that connected with remarkable frequency. In her four most recent fights, Shields landed 40.8% of her power punches but against Hammer – universally regarded as Shields’ toughest opponent to date – she landed 44.3%. Moreover those blows landed with authority and, to these eyes, Hammer’s conditioning allowed her to remain upright more than any lack of power on Shields’ part. But as impressive as Shields was on offense, her biggest improvement was on defense. She not only slipped Hammer’s vaunted jab time and again, she also avoided several combinations without being struck. Shields’ defensive numbers were scintillating: She was struck by only 13.4% of Hammer’s total punches, 10.9% of her jabs and 17.6% of her power punches, a marked improvement over the 20.5%, 14.8% and 23% she yielded against her four most recent foes (Tori Nelson, Hanna Gabriels, Hannah Rankin and Femke Hermans). The bout was mostly fought at Hammer’s pace as Shields averaged a modest (for her) 38.7 punches per two-minute round to Hammer’s 36.6. However Shields’ superior accuracy overall (28.9%) and in power shots (44.3%) led to connect advantages of 112-49 overall, 94-24 power and 33-4 in connects to the body. 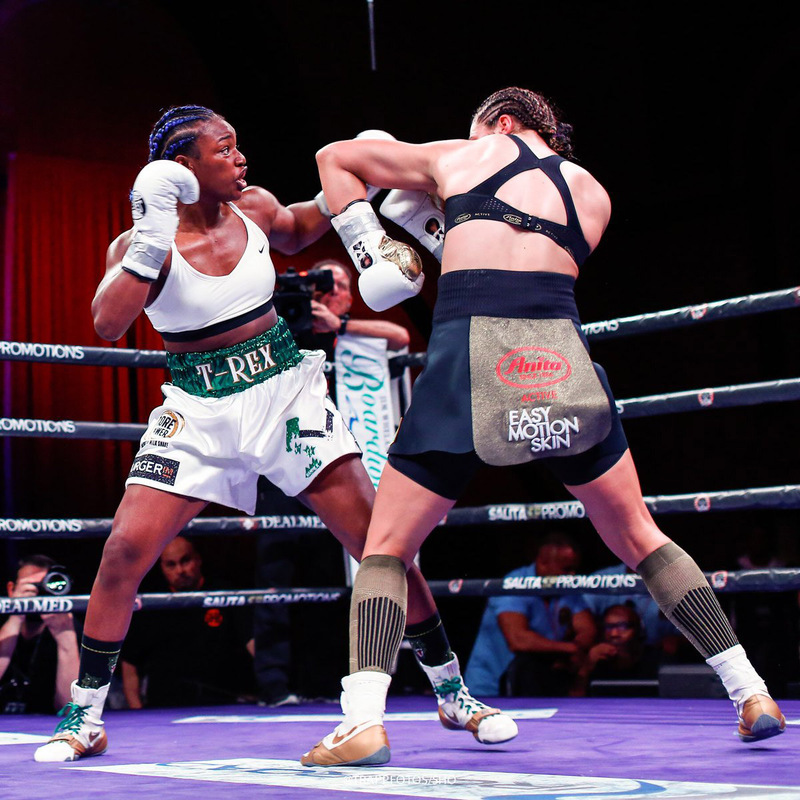 Hammer never reached double-digits in terms of total connects (the seven she landed in round 10 was her best) while Shields landed 10 or more punches in a given round six times, including each of the final three, in which she led 49-15 overall and 41-7 power. Given all this information, is it any wonder why Shields was so euphoric? Another reason to feel optimistic about Shields’ performance was her ability to channel her emotions toward execution instead of persecution. Every move was well thought out, a reflection of her cerebral head trainer John David Jackson, whose lessons appear to have been fully absorbed and implemented. Hammer did what she could to impose the fast-twitch, stick-and-move approach that earned her a 24-0 (with 11 knockouts) record and a nearly nine-year reign as WBO champion. However Shields quickly cut the distance between them and, seeing that Hammer held her chin up in the air, struck it time and again while also marking up a face that graced magazine covers and advertisements. While Hammer did produce some good moments, they were overwhelmed by the frequency of Shields’. In the end, she had no choice but to acknowledge Shields’ superiority. Perhaps so but given the lopsided nature of her loss to Shields, how will she be remembered? Will her one defeat to a “T-Rex” blot out the 24 wins she logged beforehand? Only subsequent triumphs over quality competition will lessen the memory of what happened on Saturday but nothing short of a rematch victory, then a rubber match win, will blot it out. Saturday’s result probably rules out that possibility, at least in the near future, if not forever. One must also ask what the future holds for Shields. During the post-fight interview, she identified two possible opponents: Savannah Marshall – the only fighter to defeat Shields as an amateur – and longtime undisputed welterweight champion Cecilia Braekhus, long considered the pound-for-pound best. Given her blend of size and skill, Shields would be favored to beat both. Should she do so, what then? Will she run out of viable opponents and be forced to retire in her mid-20s? Will she make enough money to step away from the game comfortably? Will she earn the crossover appeal she desires? And will she lift the women’s game to the level she wants? Women’s boxing is in a good place globally but it will be difficult – if not impossible – for this part of the sport to make its mark in the highly-segmented U.S. market. The men’s game, while in better shape now than it’s been in years, is still struggling to break through the NFL/NBA/MLB stranglehold on the mainstream sports fan. 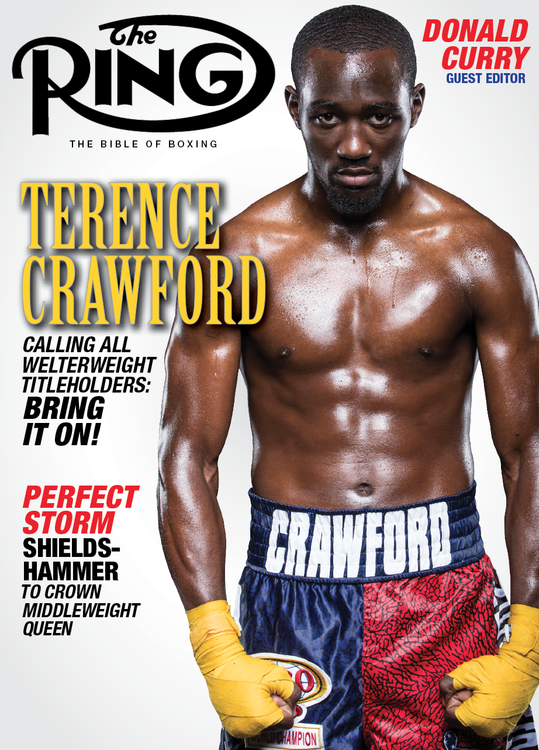 The good news is that boxing has a robust presence in the streaming universe and the sport’s weekly exposure will definitely lift the profile of the game – for the men and for the women. If the best fighters fight often enough so they won’t slip from the casual fan’s memory, they will take an important step toward improving boxing’s place in the long term. I, for one, am an optimist by nature and, because of that, I believe boxing has established the foundation by which the “Sweet Science” can flourish. 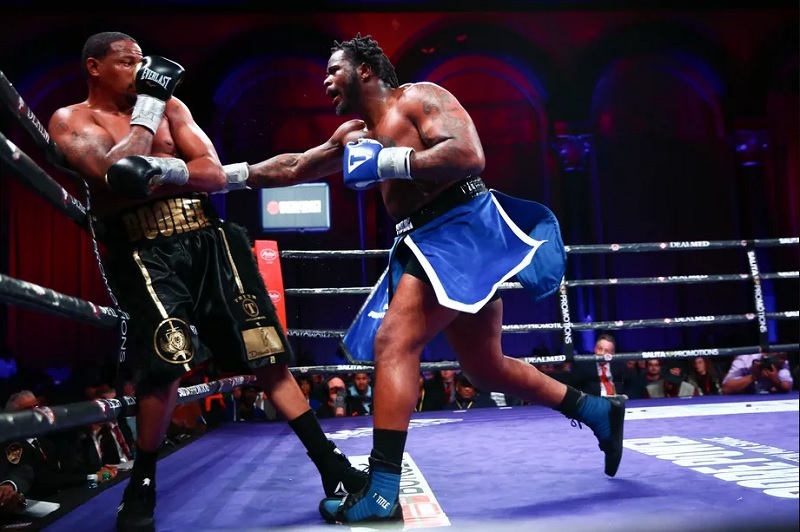 As previously mentioned in Part One, the heavyweight co-feature between Jermaine Franklin and Rydell Booker was a mystery to me because of the scarcity of recent footage on both fighters but once the opening bell rang, all became clear. First, Booker performed better than I expected, given his 12-year prison stint and 38-year-old chronology and that point was driven home with his opening jabs – jabs thrown with unexpected speed and snap while nearly matching the velocity of his undefeated 25-year-old opponent. Second, while age was represented well by Booker, youth was ultimately served as Franklin gradually pulled away in the fight’s second half with his superior work rate and competitive energy. Franklin out-threw Booker in all 10 rounds while out-landing him in nine and the 19-punch-per-round activity gap (54.1 to 35.1) was the culprit as Franklin led 146-94 overall, 41-28 jabs and 105-66 power. While the connect margins were reasonably close in rounds one through five (Franklin led 75-54 overall and 48-36 power), the spread was extended in rounds six through 10 as Franklin out-landed Booker 71-40 overall and 57-30 power, including 27-14 overall and 21-7 power in the final two rounds. The scorecards favoring Franklin were decisive (99-91, 98-92 twice) but the youngster admitted that the veteran exposed several flaws in his game that merit further attention. While Franklin was dissatisfied in victory, Booker had reason to feel good about his performance in defeat. One encouraging factor was his defense. The numbers backed Booker’s contention. Though Franklin out-landed Booker by 52 punches over 10 rounds, the percentages were almost identical – both landed 27% of their total punches and while Franklin had a 16%-15% edge in jab accuracy, Booker connected with 39% of his power punches to Franklin’s 37%. He also agreed with Franklin’s self-critical assessment. The consensus around ringside was that Booker acquitted himself well against a far younger opponent and that his blend of experience and durability would provide a nice test for any number of up-and-comers. Perhaps he (or Franklin, for that matter) could be a viable option for Otto Wallin, whose TV opener against Nick Kisner was cut short thanks to mutual cuts on both men. An accidental head clash opened gashes over Kisner’s right eye and on the side of the Swede’s head. 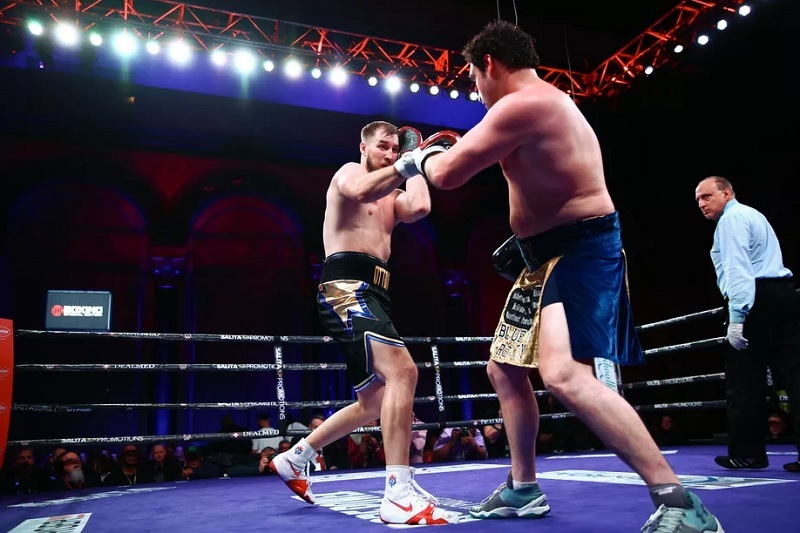 The fight was ruled a no-decision after the end of round one, closing the curtain on a fight in which Wallin led 14-3 overall, 7-1 jabs and 7-2 power as well as 29%-12% overall, 23%-17% jabs and 41%-11% power. It was a disappointing debut for Wallin, who, while researching his recent bouts, showcased an excellent jab and a powerful straight left. While Kisner was unable to give Wallin a lengthy test, the guess here is that Booker will be better able to do so. After getting the go-ahead to shut down, CompuBox colleague Aris Pina helped me pack my equipment, after which we stopped by the post-fight crew meal. I drove him back to the Ocean Resorts Casino and while he spent the next few hours with friends, I returned to my room to tend to business: Entering the night’s numbers into the master database, alerting the folks running the Showtime Boxing picks game that the data was ready to use and jotting down thoughts on the night’s action. Once I caught up on the news I missed, I turned out the lights shortly before 3 a.m.
Sunday, April 14: I awakened at 8:30 a.m. and I don’t recall waking up at any time during my five-and-a-half-hour rest. I do hope my issues with sleeping on the road are a thing of the past because I feel so much better in the morning when that happens. Following the morning routines, I tried to get in as much writing as I could before having to check out of my room by 11 a.m. Once I reached a good stopping point, I packed my belongings, took the elevator down to the lobby, turned over my room key, settled the bill, entered my rental car and programmed the address of the Avis rental car center at Philadelphia International Airport. However it would not be a Point A-to-Point B drive because I still needed to fill my rental’s gas tank. I had hoped to encounter an easy-to-access station once I crossed the Walt Whitman Bridge but the GPS didn’t steer me toward a street that had one. Instead, once I reached airport property, I turned off the GPS and managed to find a small station located less than a half-mile away. My timing was excellent; the young (and heavily tattooed) female proprietor told me she was about to break for lunch. Thanks to the hybrid’s efficiency, the bill was just $10 and the attendant kindly gave me a simple route back to the airport property: Take a left at the first traffic light and follow the signs. Within minutes, I had turned in the Ford Fusion and was walking toward the Avis bus that would take us to the terminal. There I spotted replay man Steve Bires (who I’ve dubbed “Elvis” since it’s the name of the device he runs). Our chat made the wait for the bus seem shorter than it was but the conversation that continued on the bus was cut short by the fact that our flights would be leaving from different terminals. With a three-plus hour wait ahead of me, I ate a leisurely lunch at one of the food courts, then chatted with some of my fellow passengers-to-be at the gate. One conversation was with a husband-and-wife duo who was 91 and 84 years old respectively while another was with a Boston native who was flying his family to Kentucky to scout out potential colleges for his older daughter. Here I learned about Tiger Woods’ stunning and historic victory at the Masters. Given the time of day (it was around 4 p.m., long before the customary 6:30-7:30 p.m. conclusion), I thought it was “fake news” but once CNN flashed the bulletin on its screen, I knew it was real. Because of the tortuous physical, emotional and financial travails Woods endured – some of which were self-inflicted – it ranks as one of the greatest comeback stories in sports history. And anyone who knows me well knows I’m a sucker for sports history. Once aboard the plane, I took my aisle seat in row six and chatted with my two female row-mates, one of whom spent most of the flight playing spades on her phone. That sight revived vivid memories of my time at Fairmont State College (now Fairmont State University), where I spent many down hours playing spades and hearts (while also talking lots of trash) with my buddies in the dorm room. I found myself looking at her screen and calculating how I would bid her hands and, more often than not, we came up with the same answer. Once we landed, I walked to my car, paid the extended parking fee, turned on the Sirius XM radio and bounced from station to station while winding my way home. It was a most enjoyable ride and it ended shortly after 8:45 p.m. It had been feared that I would have to endure torrential rain and potential tornadoes along the way but, aside from a burst of precipitation about an hour into the drive, all was well. While I enjoyed my time in Atlantic City, I was happy to be home. Not only will I enjoy the comforts of my sanctuary over the next 11-plus days, I will also have ample time to slice deeply into the research list. Hopefully by the time I leave for Las Vegas to cover the Showtime tripleheader topped by Robert Easter Jr. vs. Rances Barthelemy, I will have made significant progress.